The FOXPRO Patriot is the perfect option for the up-and-coming predator hunter. 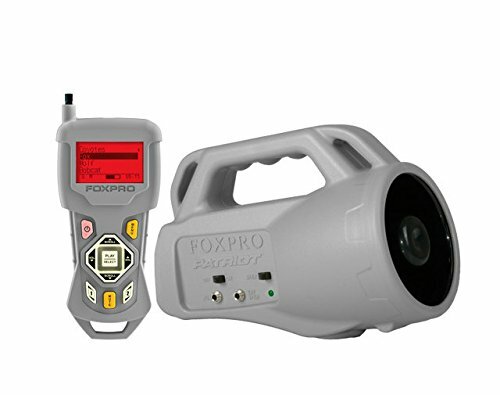 It comes standard with 35 high-quality FOXPRO sounds, an additional 100 free sounds, and has the ability to hold up to 300 sounds. The Patriot offers maximum portability with its lightweight, rugged ABS housing. The unit comes with a single high-efficiency horn speaker that delivers a crystal-clear, high-quality sound with great volume. You can connect an external speaker to the jack on the side of the call for even more volume. The Patriot also has an auxiliary jack for use with an approved device such as the FoxJack 5 decoy. The FOXPRO Patriot features an enhanced remote with an elastomeric keypad for effortless use, even with gloves. It also has category files for easy navigation through sounds. The remote has a power on/off switch, volume up/down buttons. Scroll up/down, a mute, and much more. The Patriot is backed by a 3 year limited warranty, FOXPRO's unmatched customer support, and is proudly made in the USA!